Inside the Sultan Cave Suite. The words “cave” and “luxury” do not appear often in concert. Dispelling this myth, Joe Tuck unearths the unique Museum Hotel in Uchisar, Turkey. The Cappadocia region of Turkey is a fantastical place, home to ancient cities burrowed underground, modern towns nuzzling the rocky landscape, forgotten churches hidden within nondescript caves, valleys the shape of crescent moons, and thousands of naturally formed stone pillars known as “fairy chimneys”. These chimneys, varying in visage, appear packed together like a bagful of baguettes, strewn about like misplaced shark’s teeth, or giant chocolate drops balanced atop witches hats. Whatever you ­envision during your visit, magic and imagination will take over in the golden iris of Central Anatolia – and, at its core, the Museum Hotel in Uchisar. The chilly air and stale smell of a cave room goes unheralded in brochures for hotels in the area and I was a touch wary when, at my wife’s behest, we checked in to the well-advertised and highly praised Museum Hotel. “Unique and ­Responsible” was the tagline on the promotional pamphlet. No doubt this sounded better in the original Turkish. We were greeted by Nimet, one of the boutique hotel’s charming reservation executives. When we asked about the odours and the potential for a chilly night, Nimet adamantly “tsk’d” and tilted her head up to indicate the impossibility of such things. “Our hotel sits in a valley. There are five different room categories throughout. A Deluxe Room is €250 ($320) per night for two people, including taxes and breakfast. The most expensive and luxurious suite is the Sultan’s Cave Imperial Suite ($1920 per night, per couple). In Turkey you can negotiate for most everything but we were unable to get Nimet to budge. Of the 30-plus unique suites, we opted for the Oriental Cave. Having set foot in the main common area, we could see that the hoteliers had spared no ­expense. With the serene sound of a distant harp as our soundtrack, we walked to our room. 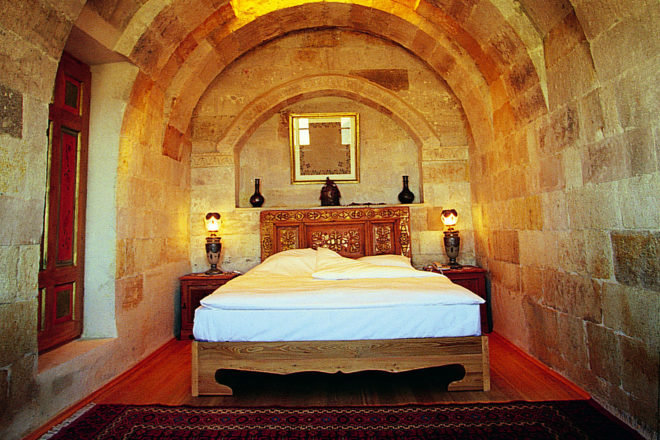 Ottoman-style paintings and regional artefacts covered the stone wall, Orientalist antiques and furnishings sat freely as though they adorned someone’s home, and when we entered our suite, we knew right away that it was possible to experience Luxury in a cave. Compact and ­elegant, the interior was decorated and lit dimly for comfort. The dreary cave wall was juxtaposed with soft bedding, colourful pillows and traditional Turkish kilim rugs and carpets. It was as cosy as a Hobbit’s den would be with all the modern amenities. Museum Hotel was the site of the 2009 Sports Illustrated Swimsuit Issue photo shoot. Eager to see the set pieces for that project, we headed out to the terrace where we were pleasantly greeted by the harpist we’d heard earlier on our ethereal walk to the room. The view was stunning. As though in box seats at the opera, we wouldn’t have to move far to see the whole show. The morning sun was greeted by a sky festooned with hot-air balloons and the terrace was ­lively, filled with travellers and lovers, merrily ­drinking their tea, juice and champagne and sampling from a delightful Turkish breakfast spread. The region lay encapsulated before us. If you needed only one picture to adequately capture your trip to Cappadocia, it would be from the terrace of the Museum Hotel. Tekeli mah. No. 1 Uchisar – Nevsehir ­Province, Turkey. May and September are the best times of year to visit. The weather is perfect, rates are lower and the tour buses have yet to arrive en masse. Lil’a Restaurant is your option for dinner. The menu features typical Turkish appetisers and salads, and predictable kebab and fish-style main courses. If this is your first foray into Turkish cuisine, you’ll love it. For us, given the class and originality of the hotel, our expectations were quelled when Lil’a did not give us a new foodie experience. Dinner for two was around $110.